Dress your furniture in sophistication with the Deluxe Reversible Quilted Furniture Protector. 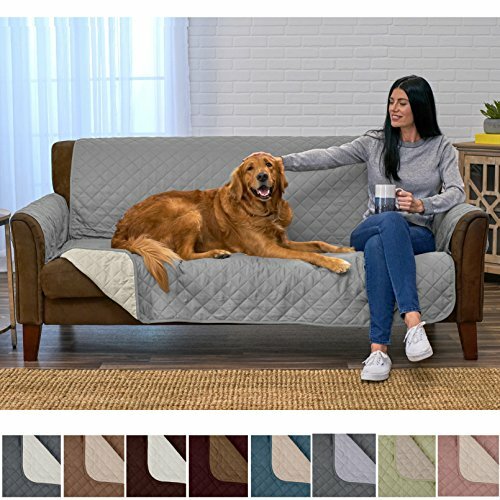 With its beautiful quilted texture, lofty poly fill and soft suede-like finish, this furniture protector provides designer style and ultimate comfort while shielding and protecting sofas, loveseats and chairs from spills, stains, wear and tear. It's a must-have for homes with children or pets. The Deluxe Reversible Furniture Protector comes in a variety of beautiful solid color combinations that reverse for a fresh new look, so it's like getting two furniture protectors for the price of one. Our furniture protectors are one-size-fits-most. Our Sofa Furniture Protector measures 75 inches x 110 inches and fits most sofas 96 inches long arm to arm; our Loveseat Furniture Protector measures 75 inches x 88 inches and fits most loveseats 73 inches long arm to arm; our Chair Furniture Protector measures 75 inches x 65 inches and fits most armchairs 34 inches long arm to arm; and our Recliner Furniture Protector measures 79 inches x 65 inches and fits most Recliners 34 inches long arm to arm. However, as with any one-size-fits-most products, we can't guarantee that they will fit your furniture. Before ordering, we recommend measuring your furniture to determine the right size! Please note that the Deluxe Reversible Furniture Protector may not cover your entire piece of furniture like a traditional slipcover (see photos above). If you are looking for a full SLIPCOVER, see our SAVANNAH, DAWSON or LUCIA COLLECTION. PERFECT FOR PETOWNERS: PROTECT your furniture from the wear and tear of your furry family member. Perfect for homes with children and pets and even your college apartment. FITS MOST FURNITURE: Our furniture protectors are one-size-fits-most. Our Sofa / Couch Furniture Protector fits most Sofa / Couchs 96 inches long arm to arm; our Loveseat Furniture Protector fits most loveseats 73 inches long arm to arm; our Chair Furniture Protector fits most armchairs 34 inches long arm to arm; and our Recliner Furniture Protector fits most Recliners 34 inches long arm to arm. Please see product description below for more details on sizing. REVERSIBLE: Features two gorgeous solid colors. It's like getting two for the price of one! COMFORTABE, STYLISH AND HIGH QUALITY: Beautiful quilted texture, lofty poly fill and soft suede-like finish for designer style and ultimate comfort. (Note: Not recommended for leather.) EASY CARE: Machine washable.